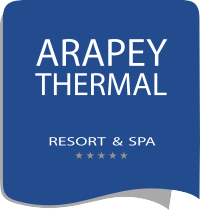 A new team of professionals is integrated into the concept of rest and relaxation offered by Arapey Thermal Resort & Spa. Renewed therapeutic techniques defined in our Menu of Services, allow combining aesthetics and relaxation with healthy thermal waters that come alive in an environment of nature and harmony. (System of deep manipulative techniques, of soft tissues and articulations, oriented to eliminate the pain, realignment of the posture, restoration of functions, dissolution of deep contractures, myofascial restrictions and joint blockages. (*) Both treatments include deep thermogenesis (internal heat generation) with radiofrequency equipment, circulation stimulator and muscle recovery. I'd like to receive emails, updates and newsletters from Arapey Thermal All Inclusive Resort & Spa.